New York City is reportedly planning to write a rule that would require Uber to offer an in-app tipping option. On Monday, regulators with the Taxi and Limousine Commission in New York City said they plan to begin the process of writing the rule. The rule would require all cab companies that take payment via credit card to offer a tipping option. TLC Commissioner Meera Joshi said the rule is “just one piece of a more comprehensive effort to improve the economic well-being of drivers.” It plans to introduce the proposal by July or earlier. The suggested rules would need to go through several layers of approval before they can be enforced. The process is expected to take several months. Uber has long resisted pressure to add the ability to tip drivers to its app. The new rules would be a major change in how Uber runs its business in its largest United States market. If New York City is successful, it could increase pressure on Uber from drivers in other cities around the world. The decision was prompted by a petition from the Independent Drivers Guild, a non-union worker body affiliated with the International Association of Machinists and Aerospace Workers. The petition collected more than 11,000 signatures. Drivers have campaigned for the option and rated the issue as their top concern in a survey last summer. Uber says riders are free to offer cash tips, but notes on its website that “Uber is a cashless experience. Tipping is voluntary.” Uber’s biggest competitor in the US, Lyft, already offers passengers the option to tip drivers through its app. People who ride in taxis can tip with their credit cards or cash. In January, Uber paid the Federal Trade Commission $20 million to settle claims that it misled drivers about pay. 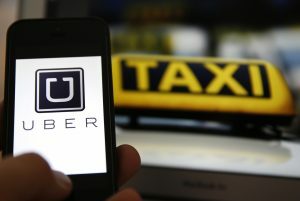 The agency found the median income of drivers in New York is $29,000 less than Uber’s claim of drivers there making more than $90,000 a year. In Denver, Detroit, and Houston, Uber drivers earned less than $13.25 an hour after expenses. The IDG estimates tipping will be worth an extra $300 million to drivers in the city every year. National Bank Financial Brokers Increase Earnings Estimates for Pan American Silver Corp.
Baltimore Washington Financial Advisors Inc. Sells 1,571 Shares of BlackRock, Inc.